>The Domino BISHOUJO is here! Mr. Arigato here with the latest Bishoujo update from our product planner SHO-GUN. Enjoy! 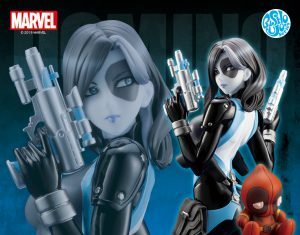 Pre-orders for Domino are here! Check with your local retailer for details! Thanks to her appearance in Deadpool 2, the character has become more popular. She looks different in the movie, but we decided to base the BISHOUJO on her costume from the current comics by Gail Simone and David Baldeon. Often seen in riding suits, this updated version of Domino’s costume has garnered lots of attention from fans for its stylish design. And, this is the first product based on this version of Domino’s costume!! Naturally, Domino is a must-have for Deadpool and Marvel fans. 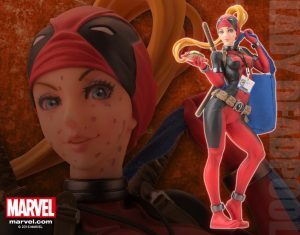 Deadpool has appeared in the BISHOUJO line as well, so I hope you’ll consider displaying the teammates together. We also released a limited edition version of the Lady Deadpool BISHOUJO. 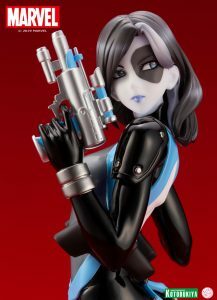 Domino was stylized as a BISHOUJO by series illustrator Shunya Yamashita! It’s a striking illustration that’s both beautiful and cool! We took care to give the illustration a variety of textures and the distinct marking on her face. 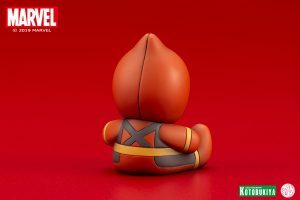 The little Deadpool at her feet is also pretty cute! 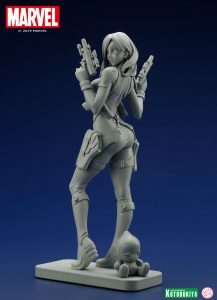 The sculpt was created by Yudai Seki, who is a newcomer to the BISHOUJO series! We worked hard to get all of the details just right from the very start with the sculpt. Seki is working on some other BISHOUJO now! Stay tuned for updates! Now let’s take a closer look at the statue! With dramatic lighting, she looks especially mischievous and beautiful. Her cool expression and pursed lips show off her determination. I’d also like to show off her highlights! I think the paint really recreates the smooth and sleek texture of her black hair from Yamashita-sensei’s illustration. The blue tones of her lips look great against her porcelain skin. We also used pearlescent paints to give her a stylish look. From one angle, she looks cool and composed. From another, she can look completely different. 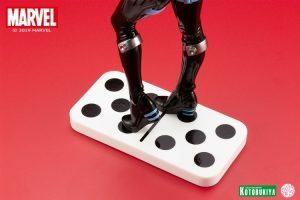 I think this is something that can be enjoyed with all figures, but it’s especially true in the case of Domino! She even looks cool from behind. Each piece is carefully painted! The pale, almost translucent color of Domino’s white skin, the contrast with her shiny black suit, the metallic silver of her accessories… we tried to match each paint color to recreate the different textures of her elaborate costume. Her suit is so shiny you can even see the Domino base reflected in her leg! Did you notice before I pointed it out? The holsters have a matte finish. Looking back over the details, despite having only a few colors, it’s actually quite and elaborate costume! The base is a domino tile! In Japan, most people only know about lining up dominoes to knock them down, but working on this statue I also learned about the actual game of dominoes. I was surprised by how much of it relies on luck! It’s actually perfect for a character like Domino, who has luck on her side, so I decided to add that aspect into the base! 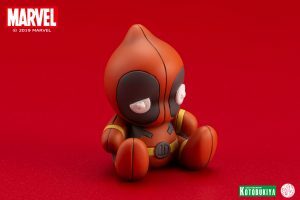 The Deadpool doll can be displayed wherever you want. This cutie’s pudgy proportions somehow give me a sense of of security. His eyes are made of white buttons sewn on with thread. It makes me want to pick him up and give him a hug! Pre-orders are available now! Check out your local retailer for details! 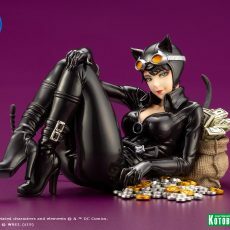 前の記事 2019.02.20 DC Comics BISHOUJO: Catwoman Returns!